This hand colored map is a steel plate engraving, dating to 1815 by the important English map publisher John Thomson. 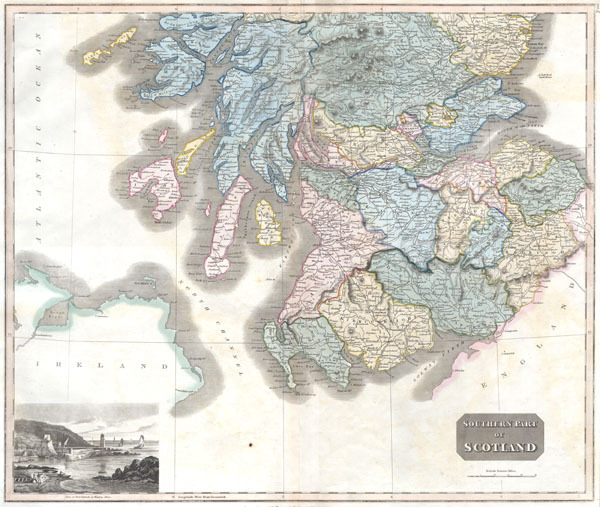 It depicts the southern portion of Scotland from the Island of Mull to the border with England. In the lower left hand corner of the map there is a view of Port Patrick in Wigton Shire. Prepared for Thomson's New General Atlas. Very good contiion. Minor repair along upper part of original centerfold. Blank on verso.